At first glance, Let It Ride poker looks like it might be too rich for most bettors’ blood. You do place three wagers at once – all of equal value – but really is your original ante bet the only money on the table. As the name of the game would infer, players can either let the second and third wagers “ride” or they can pull them back, depending on the strength of your hand. So if this is your first time looking at Let It Ride, don’t be put off by the way the bets are placed. The great thing about Let It Ride is that you can really cash in when you have a great hand, rather than just winning a standard bet. Because you have three bets in play, getting three solid cards to start won’t go to waste. 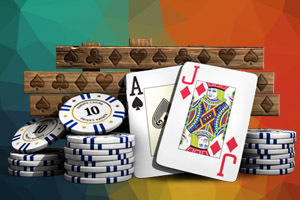 Players are recommended to “Let it ride” if they have: a pair of 10s or better, any three cards of a Royal Flush, three to a straight flush, and three to a straight. When chasing a straight in Let It Ride, there are two ways to separate the strategy. If you have three or four cards that could make a straight but are missing cards inside – like drawing a 6,7,9,10 – you then need an inside card – in this case an eight. If you drew a four-card hand of 7,8,9,10, you then need cards outside of the straight – in this case a six or a Jack will complete the straight. Outside straights are easier to complete, so be more aggressive chasing those rather than trying to make an inside straight.